The Outbreak of the One Year War, in a Blaze of Hellfire Oct 01, 2017 84 Min. Universal Century 0079. 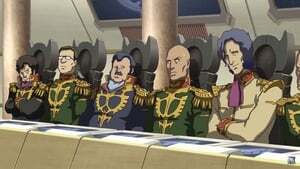 Humanity has turned even space itself into a battlefield, and the Principality of Zeon forces advance after wiping out half the world’s population by carrying out the Operation British (colony drop). In response, the Earth Federation Forces mobilize their overwhelming fighting strength to regain the advantage. The complex intrigues of the Zabi family… Sayla Mass, as she contends with the whims of fate… Hamon and Ramba Ral, who is now a pilot in the Zeon forces… Amuro and Fraw, leading peaceful lives at Side 7… a dark shadow falls across them all. And the Zeon ace Char Aznable, driven by revenge, goes into action as the “Battle of Loum” finally begins.